Is Your Business Prepared & Protected? As shared by the non-profit organization, Life Happens, as a small-business owner, you’re responsible for two families: the one you have at home, and the one you have through our business. No matter what your business, a well-conceived insurance and benefits program is essential. One of the first things any business owner needs to consider is how to protect against events that may threaten the future of the business, like the death or disability of a proprietor, partner or key employee. What would be the impact to your business if your company lost one of its vital resources (a key partner or employee) due to severe injury, illness or death? You’ll discover how Key Person Insurance can help you to mitigate these risk to help your business continue beyond an unexpected event. 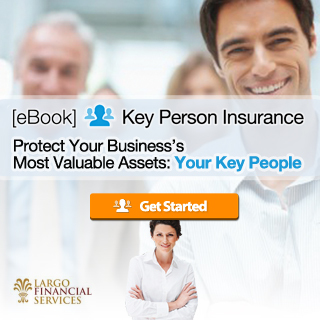 Fill out the form below to download this free Key Person Insurance Ebook from Largo Financial Services today!